Why do teachers need to ask better questions? There are many responses to this question, but a short, one-word answer would be Google. If I can Google the answer, then I don’t need to ask the question. Gone are the days when teachers need to simply impart their knowledge on a class full of students. 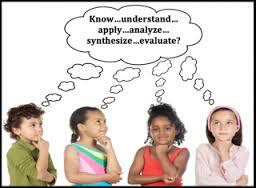 We need to create engaging environments where our students learn to ask questions and find solutions. They need to discover how to find reliable resources. They need to work with teams to brainstorm, research, create, and innovate. All of these skills stem from higher order questions. The inquiry doesn’t even have to come from the teacher. In a community of respected/respectful learners, questions will be raised by both students and educators. More learning will occur and be sustained by students searching out answers and solutions rather than passively taking notes while the teacher delivers information. I liken this a bit to faculty meetings. If something can be emailed out to staff members, then it shouldn’t take up time during a meeting. If students can locate the information accurately and efficiently, than the teacher shouldn’t take up time during class lecturing on it. Brava, Janelle! Great thoughts about questioning. Thanks for the links to the two articles, too. I enjoyed reading them and learning from them. I like this quote from your post, “In a community of respected/respectful learners, questions will be raised by both students and educators.” Nice. I like it when we are a community of learners, not a hierarchy between teacher and students. The teacher should be the chief learner, as Donald Graves put it.